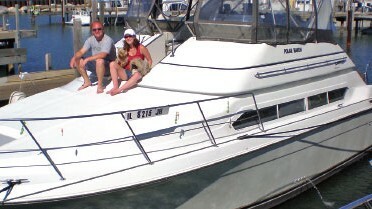 The seller wants this boat to be the next 48 foot 3 cabin boat sold. He has found his next boat and is ready to deal. Jefferson is known for its quality and comforts. 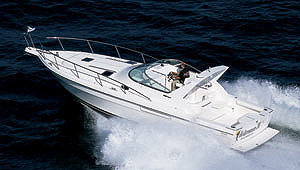 You'll not find a boat with more truly usable storage space. The exterior living accommodations includes a large sundeck with hard top and a very large flying bridge with seating for eight. The interior offers an unusually large salon and galley up arrangement, A full beam master aft cabin with in-suite head and stall shower, Bunk berths to starboard and a queen sized guest berth forward. Maybe the best part is the engine room which is very spacious. You can get to every service area with ease. You can even get to the outside of the engines! 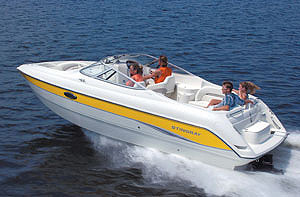 This boat, when operated at 8.25 knots will burn 4.4 GPH (1.8 MPG). 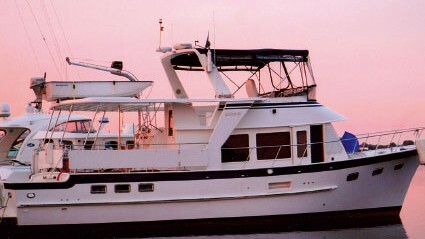 Here is a great opportunity to own a quality three cabin motor yacht for a very reasonable price. She has just been Awlgripped. 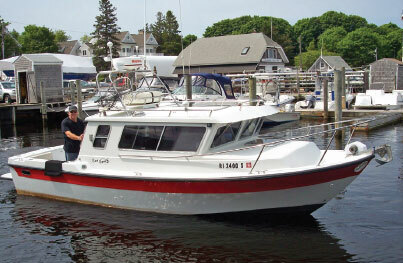 She is a great live aboard and capable of doing the Bahamas or the Great Loop. You set the goals and she will do the rest. Entry is through a door located to port. Down five steps into the salon with large opening windows port and starboard. There are storage cabinets port, starboard and aft. An L-shaped leather sleeper sofa aft to starboard with a cocktail table. Forward to port is an L-shaped dinette with beige fabric. To starboard and forward is the spacious galley. Going down four steps forward is a hallway leading to the guest cabin. Upon descending the stairs is a walk in pantry to port with numerous shelves. Across the hall is a guest cabin with upper and lower bunk style berths. Further forward to port is the hall entry to the day/guest head. Forward of there is the guest cabin. Aft of the salon and down five stairs is the master suite. All interior finish is satin varnished maple. All soles are maple. Headliners are vinyl. Dark tinted window with three opening sections port and starboard. Cellular shades on all windows. Salon sole is removable for access to the engine room if needed. (4) Large glass door cabinets aft. Television cabinet with tambour closure. Master electrical panel to port. (4) storage cabinets outboard of sofa. Large cabinet over master staircase. 22KBTU reverse cycle heat/air conditioning. Beige fabric L-shaped dinette seating. (3) Large storage lockers forward of dinette. Galley cabinets with solid surface counter tops. Soilid surface sink with single lever European style spigot. Second galley cabinet with solid surface counter top. GE house type refrigerator with freezer. Kitchen Aide 2 burner cook top. Nights stands port and starboard. (11) Storage lockers with shelves. (3) Opening port lights with screens. Vanity with solid surface counter and sink. Raritan electric fresh water marine toilet. Separate shower stall with glass bi-fold door. 120vac light over vanity and mirror. Opening port light with screen. Semi walk around queen berth. (2) Drawers under berth (holds chart kits flat). (4) Opening port lights with screens. 12kbtu Cruiseair reverse cycle heat/air conditioning. Large cabinet over vanity with mirror. Over/ under bunk style berths. (2) Opening port lights with screens. Wood framed glass wing doors (Awlgriped white). Full enclosure with U zips. Full enclosure with 7 U-zips. L-shaped settee with storage under to starboard. Huge storage under the flybridge console. Helm station with full engine controls and instrumentation. (2) 240vac inlets with Glendinning cable master. Master panels with branch breakers in the salon. 240vac Breakers at each inlet. 31 Series battery for generator. (2) Volvo TAMD72P EDC diesel engines rated at 430 hp each. 2.25" stainless steel propeller shafts. (2) Racor 100 fuel filters. (2) Algea X fuel cleaner systems. Racor FG 500 filter for generator. (2) 300 Gallon aluminum diesel fuel tanks. 120vac florescent lights in engine room. Fresh water wash down in engine room. Morse engine controls at helm. (2) 75 Gallon aluminum water tanks under aft berth. 50 Gallon waste water tank with deck and macerator pump out. All underwater through hulls are Perko bronze with seacocks. PVC deck box on fore deck. Stainless steel hand rails with gates port and starboard. Swim platform with swim ladder. Dinghy davit crane on sun deck roof (800# capacity). Anchor with 100' of chain and additional rode. Halatron automatic fire suppression system. Hand rails at each stair case. Lounger on sun deck roof.